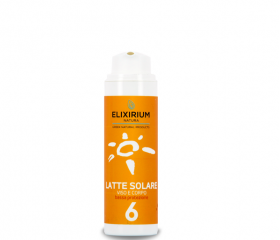 Elixirium Natura :: ELIXIRIUM NATURA - SUN PROTECTION FACE AND BODY MILK SPF 6. 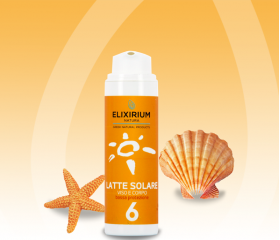 HomeElixirium NaturaELIXIRIUM NATURA - SUN PROTECTION FACE AND BODY MILK SPF 6. ELIXIRIUM NATURA - SUN PROTECTION FACE AND BODY MILK SPF 6. Fluid emulsion with enriched sunscreens with Tyrosine, which stimulates the activation of the melanin, for an intense tan and lasting. Adding active ingredients like Aloe Vera, Vitamin F and E, Jojoba Oil, Oil of Cocco and Allantoina makes the product easily absorbed and strongly moisturizing. Suitable for the cosmetic treatment of skins slightly tanned, dark and / or naturally resistant to the sun.